Waterfront Bar & Grill in Plymouth. IN THE KITCHEN The Waterfront Bar & Grill opened in June 2010, and general manager John Masotta Jr. has been at the helm since day one. In fact, he’s been on board even longer than that — he was toiling behind the scenes before the Plymouth restaurant even opened. “We did a complete renovation here,” Masotta said. “We knocked down walls, extended the roof, and built a new bar,” among other things. He also helped develop the menu. The place is owned by Mike Cardelle of Duxbury and two other partners. Cardelle and Masotta used to work together across the street at the East Bay Grille, where Masotta was a manager and Cardelle was general manager. Masotta said they decided on this joint venture because it was time for a change. The Waterfront serves up American cuisine and plenty of seafood. In the kitchen, chef Robbie Harriman, a Carver native, prepares steaks, scallops, scrod, salmon, and swordfish, as well as specials that change daily. 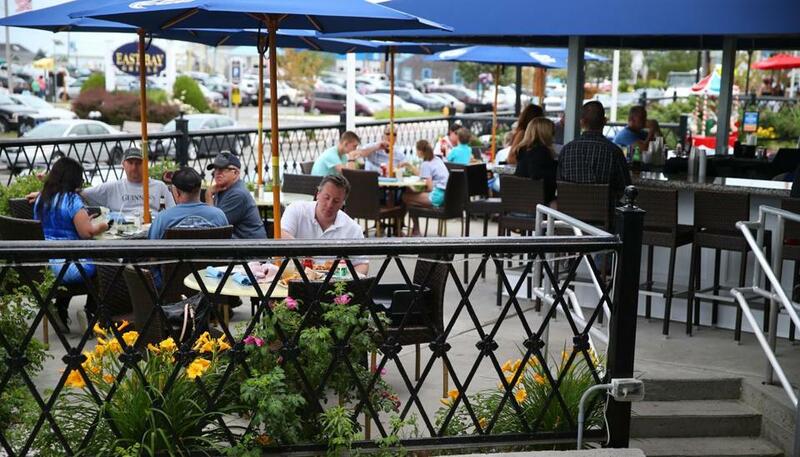 One thing that sets Waterfront Bar & Grill apart from other establishments is the outdoor raw bar, where you can sit outside on the patio, order little neck clams and Duxbury oysters, and watch someone shuck them for you right there. THE LOCALE As its name implies, the restaurant faces the ocean. Windows dominate the second floor and provide wonderful views of Plymouth Harbor. Inside, the decor is upscale, but the atmosphere is relaxed and laid back. A large bar anchors the upper level of the restaurant, and several televisions broadcast sports. There’s outdoor seating on two floors. With so many seating options, it’s one of those rare places that’s suitable for all sorts of occasions: a romantic date, catching up with co-workers, a family dinner, or a night out on the town. Depending on the night, Masotta said, the live entertainment could be a full band or a DJ spinning a dance party. “It varies,” he said. On Monday nights from 6:30 to 8:30 p.m. there’s competitive trivia, with prizes, in the upstairs bar. On Thursday nights, DJ Skip starts playing music at 9 p.m., and dining gives way to dancing. ON THE MENU The Waterfront Bar & Grill is open daily from 11 a.m. to 1 a.m. and the dinner menu is available all day, every day, until 10 p.m. Lunch is served Monday through Saturday until 4 p.m., and a brunch menu is offered until 2 p.m. Sundays. For starters, the dinner menu features an array of appetizers, including New England clam chowder (cup $6; bowl $7); mussels sauteed in a white wine sauce with tomatoes, garlic, leeks, and grilled focaccia bread ($12); and Harriman’s signature stuffed quahog ($6). There are nine salads, ranging from the basic garden salad, made with mixed greens, tomato, carrots, cucumbers, red onion, and croutons ($6) to the fruity Waterfront Salad, a bed of mixed greens topped with sliced strawberries, blueberries, red onion, toasted pine nuts, and diced baby Swiss cheese ($12). Entree choices include pizzas, pasta, sandwiches, steak, chicken, seafood, and other offerings, such as a boneless short rib served over mashed potatoes with sauteed spinach and an Irish stout demi-glace ($20). During our recent visit, I tried the shrimp cocktail. Each piece of shrimp cost $4, but it was money well spent — they were huge, and accompanied by a zesty cocktail sauce that was delicious. For the main course, my companion and I enjoyed the steak tips ($18) and grilled swordfish topped with tropical fruit salsa ($23), and we savored every bite. Afterward, we danced to the sounds of Madonna, Prince, and disco hits played by the friendly DJ — a perfect way to cap off a tasty dinner. Waterfront Bar & Grill is at 170 Water St. in Plymouth. 508-591-8393, www.plymouthwaterfront.com.